Or that's what we've been calling it around here! 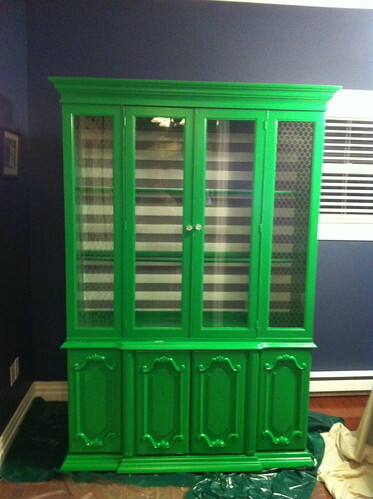 A few weeks ago we (being me) found a free dining room cabinet posted on Kijiji. You can see a little sneak here and here. But the transformation has been nothing short of epic around here and so I felt that the Jolly Green Giant deserved her very own post. So after a favor from my Dad and cousin- a.k.a a willing lifter with a truck-we picked her up. This is what she looked like- top & bottom- before her transformation. I was lucky it was a beautiful day so I sanded her outside in the extra driveway. Then I had M give me a hand in bringing her into the dining room to prime and paint her. 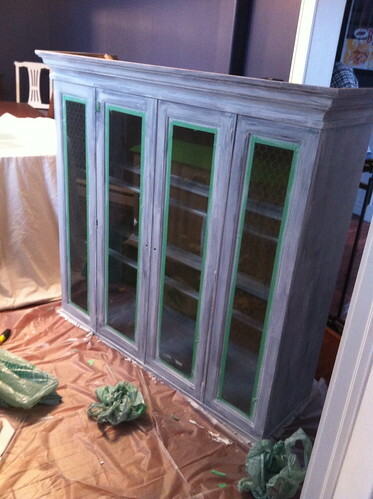 I gave her a coat of primer and three coats 'emerald isle' eggshell Behr paint as well as new hardware before adding a little something to the thin wood backing. *Not the greatest lighting so you can't really get the full effect of the green. I picked up a roll of grey and white stripped wrapping paper-yes, you read that right- and covered the back of it. I love it. Then we heaved her up the staircase and into the craft room. And I filled her. Ain't she a beauty?! She's wonderful for storage but honestly, she's huge! Here's another view. But boy is she a beauty! She sure makes me jolly! Wow! Great job and you can't beat FREE! Georgeous. 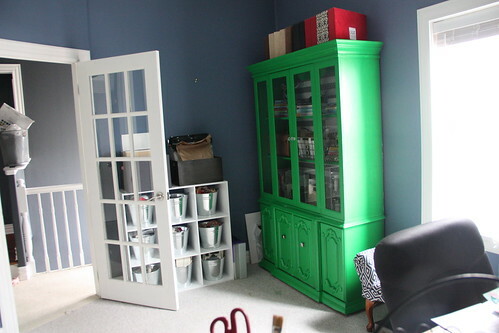 What line/type of Behr Paint did you use? I'm curious about durability since Melamine has been banned :-( Its lovely. I'd like one in soft grey or blue. 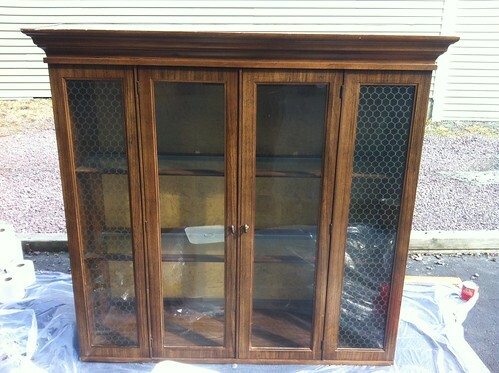 I have a similar one in my dining room but it matches my dining set. 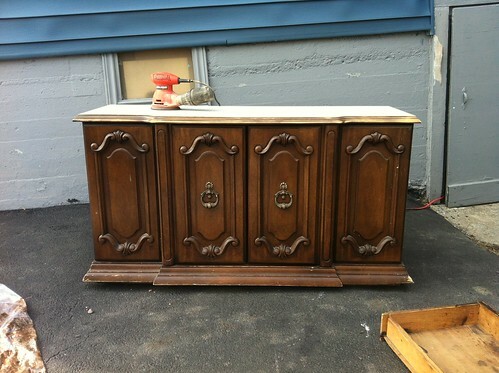 Perhaps when i upgrade the dining part, this lovely piece will upcycle to the craft room. 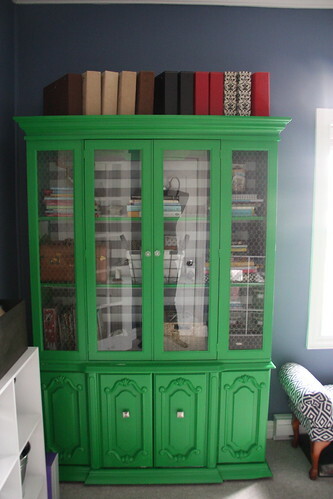 I love your upcycling/DIY interspersed with the crafty stuff. I love this - awesome!! And yes, great find!!!! Also... missing my french doors in my room... maybe when I have to extend.. hmmm... can I extend when I only renovated last summer? have a great day! Mom and I both LOVE THIS! She's gonna be so excited when I go home and show her today. WOW, what a great idea. I have two in my basement doing nothing. Actually been trying to get rid of them. Maybe at least one of them needs to stay now.